Left, right, right, left, jump, dodge… CRASH! 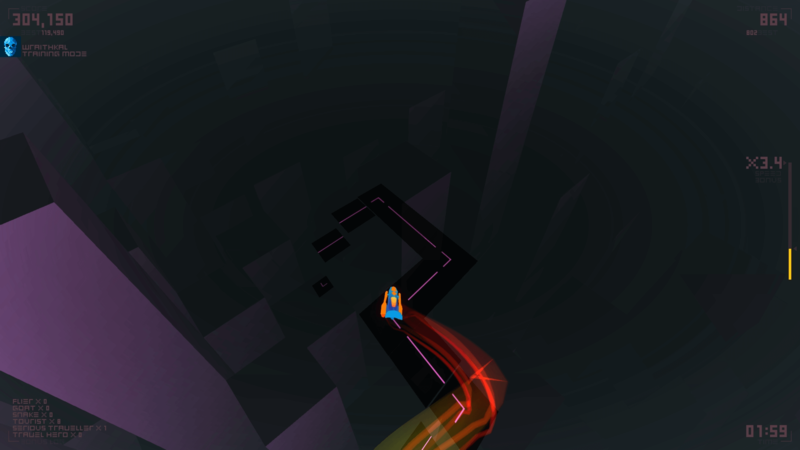 That pretty describes my early attempts at playing Goscurry, as its seemingly endless roads are just full of surprises. Turning to stay on track as the path curves – hardly challenging. But throw in obstacles that require either jumping or side-stepping to avoid a rather explosive outcome of ship-meets-wall however, and the difficulty ramps up significantly. Also, your ship doesn’t have any brakes installed. Groovy. Exactly why you chose to ignore the need for brakes is beyond me, but I guess the game would be kinda boring if you could just slow down whenever things got too fast and furious. You can however increase the pace at any time by boosting, which in turn helps you net a higher score. Provided you’re skilled enough to handle the added challenge of course. See, each run only lasts until you either crash into a yellow wall or veer off the road, at which point you’re presented with a score based on how well you fared. A simple enough concept that’s incredibly easy to pick up and enjoy, while at the same time, most will likely need a lot of practice to really get far in terms of record-setting / -breaking. At least its creator is aware of this, as you’ll be able to retry within seconds of failing, no silly load-screens or other delays. 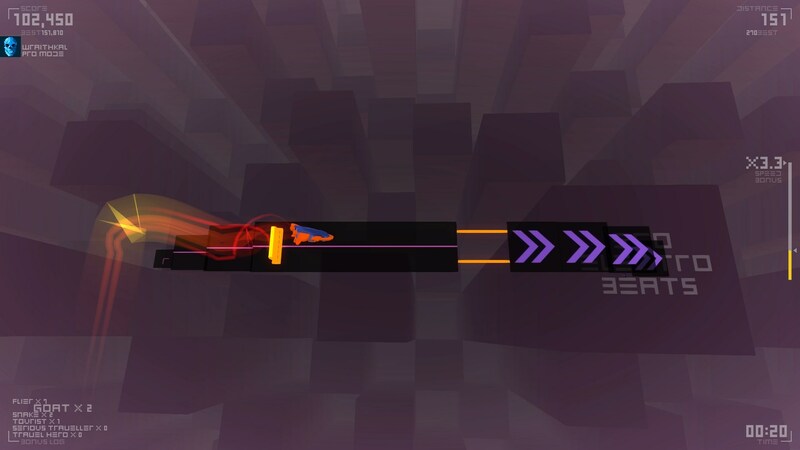 Early on, you’ll probably want to stick to the first of five modes, which is ‘training’. Here, it’s just you and the road, with a camera that follows every turn you make and no obstacles to deal with. At all. Once you’re comfortable with the controls, it’s onto ‘hard’, which introduces barricades, gaps and walls, meaning it’s time to do some serious jumping, twisting and turning… on top of keeping your ship firmly planted on the road. Camera’s still locked behind ya though, unlike in ‘pro’, which features a fixed angle. Oh and don’t even get me started on the insane pace of ‘freak’, where 99% of the layout is boosters! Good luck. You’re gonna need it. As you go along, racing through city after city, you’ll be treated to a variety of messages on buildings now and then. Exactly what these mean – if anything – remains a mystery to me. Some did however leave me wondering… if there isn’t in fact an end at some point, somewhere, at the end of this lengthy road? Some are just questions, while other are cries for help, and then there are those which make no sense at all, like a bunch of numbers. Numbers. What is going on in this strange world, and even more so, why is the protagonist determined to race through it at such high speeds? Peculiar. Much as I’d like to think otherwise, it’s doubtful that those questions – or said cries for help – will ever be answered. 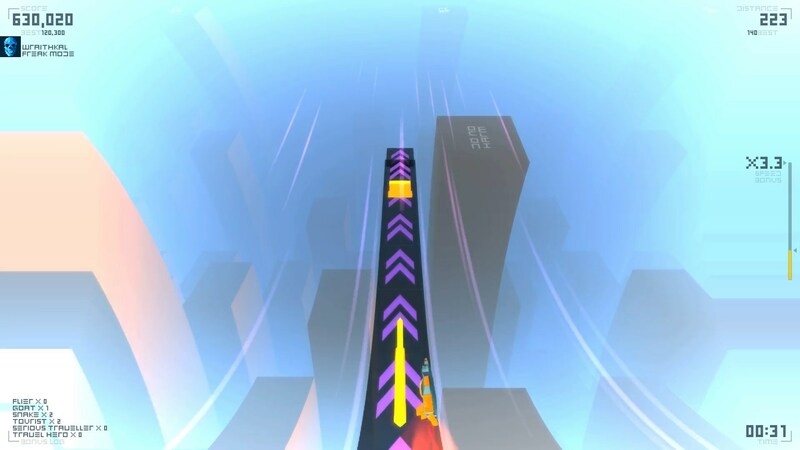 Not that it really matters much, as the constant chase for a higher score and / or further distance is likely what’ll make most players come back to Goscurry, again and again. That and the unlockable ships, which are acquired through… wait for it… achievements! Yup. Those silly things actually have a purpose here, even if the change is purely cosmetic. Still a nice piece of bonus content though. Speaking of appearances, while the minimalistic art style isn’t going to appeal to everyone, I’d say it goes well with the gameplay. Not that this translates to an overly simplistic experience, mind you, as the different modes do make for quite varied score-chasing. ‘Paranoid’, the fifth and final, in particular, as here… you’ll be tasked with actually crashing through purple obstacles instead of avoiding them, while all other rules still apply. Neat, eh? More like incredibly challenging, but in the best possible way. Its main issue, if any, lie within the somewhat repetitive gameplay, as most of the time you’ll be doing the same thing over and over. Not like that’s any different from most other game arcade / score-chasers though, and it does have that lovely ‘just one more attempt’ design for sure. On a more positive note, the visuals are stylish, controls are tight – even with a keyboard – and quite frankly, the soundtrack (Bandcamp, CD Baby, Gumroad, iTunes) is almost more addictive than the game itself (which is saying something). So what if the gameplay gets a bit samey after a while? Doesn’t mean it isn’t fun, and I for one had a blast racing through the ‘streets’ of Goscurry. Goscurry – Steam, Desura, ShinyLoot (Windows, OS X, Linux) $7.99.